St. John was the son of the Prophet Zacharias and Elizabeth, who was a cousin of the Virgin Mary. St. John is known as the "Forerunner" and "Baptist." He is known as the Forerunner because he preceded Christ and taught repentance, which prepared men for Jesus' teaching and His ministry. He even recognized Christ as the Messiah as early as when they were both still in their mothers' wombs. According to Holy Tradition, the Virgin Mary went to visit her cousin Elizabeth and when they embraced John leapt in his mother's womb, which is considered his first acknowledgment of Christ as Messiah. After his birth, St. John's father Zacharias was murdered in the temple. He and his mother fled to the desert and he was raised there. Thus he lived as an ascetic from the earliest part of his life. He ate plants and roots and wore rough clothing. When he grew, he baptized people in the Jordan, teaching repentance, but also saying that someone greater would come after him and baptize with the Holy Spirit. St. John always spoke the Truth and because Herod did not appreciate his criticism, he was imprisoned. Later he was beheaded, as the result of a promise Herod gave to his step-daughter to give her anything she asked. The daughter was convinced by her mother to ask for John's head on a platter. 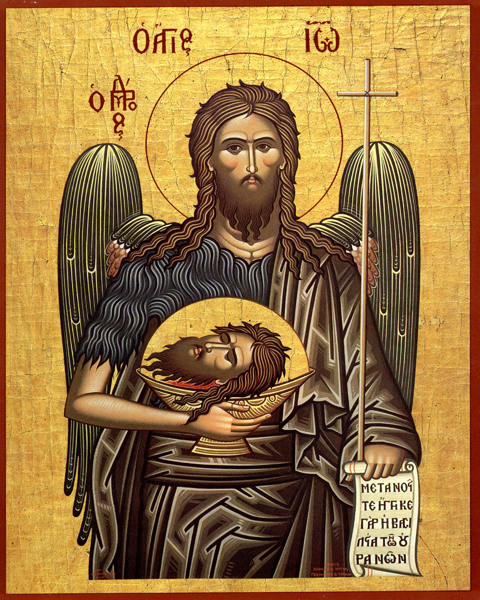 Our parish celebrates the feast of St. John's Beheading as our patronal feast day. It is a strict fast day in recognition of the way in which he died, but it is also a joyous feast day because John's life was such a luminous example for monastics, martyrs and all Christians to follow him. O Prophet and Forerunner of the coming of Christ, in spite of our eagerness to render you due honor, we fall short when singing your praise. Your glorious birth saved your mother from the shame of barrenness, returned to your father the power of speech, and proclaimed to the world the Incarnation of the Son of God. The woman who had been barren becomes fertile and gives birth today to the Forerunner of Christ. He is the greatest and last of the prophets, for standing in the waters of the Jordon River, he placed his hands on Christ whom all the prophets had announced, and in so doing he became a prophet himself, a preacher and a forerunner of the Word of God. O Baptist of Christ, Holy Forerunner, last of the prophets, first of the martyrs, instructor of fasters and desert-dwellers, teacher of purity and close friend of Christ! I pray thee; I run to thee. Do not reject me from thy protection, but lift me up who am fallen in many sins; renew my soul by repentance, as by a second Baptism. Purify me, corrupted by sins, and compel me to enter therein where no corruption can enter: into the Kingdom of Heave. Amen.